Have you seen plant-based or vegan recipes calling for a ‘flax egg’ in the ingredients and wondered what it is? Well, a ‘flax egg’ is a substitute for a hen’s egg that can be used in various recipes, including many baking recipes. It is very simple as it only requires two ingredients and takes less than 10 minutes to make. The main ingredient needed is ground flaxseed. Flaxseeds are a good source of fiber, protein and especially omega-3 fatty acids. If you can, grind your own flaxseed. Why? In a nutshell, grinding your own flaxseed ensures the most nutrient retention, as light and long storage times can reduce the amount of polyunsaturated fatty acids, such as omega-3 fatty acids and conjugated linoleic acid (CLA), available from commercially ground flaxseed meal products. There is also a greater chance of the ground flaxseed becoming rancid as it has been exposed to oxygen longer. If you do buy commercially ground flaxseed products, choose the ones with opaque containers and freeze the quantities that you don’t use right away. I generally keep a small opaque lidded bottle of the ground flaxseed in the refrigerator so I can easily access this when adding or sprinkling on flaxseed into foods. The recommended daily goal is to aim for about 1 tablespoon of ground flaxseed added to foods or drinks like smoothies. (Note: it is recommended to use ground flaxseed rather than whole flaxseeds in foods, because the whole flaxseeds will not be as well digested by your body compared to ground flaxseed, giving you less of a nutritional benefit.) However, I keep most of the ground flaxseed (I usually grind a large quantity at a time) in an opaque lidded bottle in the freezer section of the refrigerator so this will keep for a longer time. You can also choose to keep all your ground flaxseed in the freezer compartment, and just take out what you want when you need it. You can then directly use the ground flaxseed in your recipes without waiting for it to thaw, as it stays in the ground textured consistency. For more information, see the sources listed below. A straightforward easy recipe to make a flax egg that works great as an egg-substitute in most recipes. Grind flaxseed in a mini food processor until a fine ground texture is produced (if you don’t already have ground flaxseed available). In a small bowl, mix a tablespoon of ground flaxseed with 3 tablespoons of water (or unsweetened fortified plant-based milk). Let this mixture sit for at least 5 minutes before whisking it briskly for about 2-3 minutes. Ready to use in your recipe! You can use original flavored fortified plant-based milks, but the end product will be a little bit sweeter. This would be fine if you are making a baked or other sweet-tasting recipe. However, if you plan to cook a savory dish, it may be best to use unsweetened fortified plant-based milks for the most nutrition when making flax eggs. Keep in mind that the longer you let the flax egg mixture sit, the more gluey and thick in consistency it becomes. 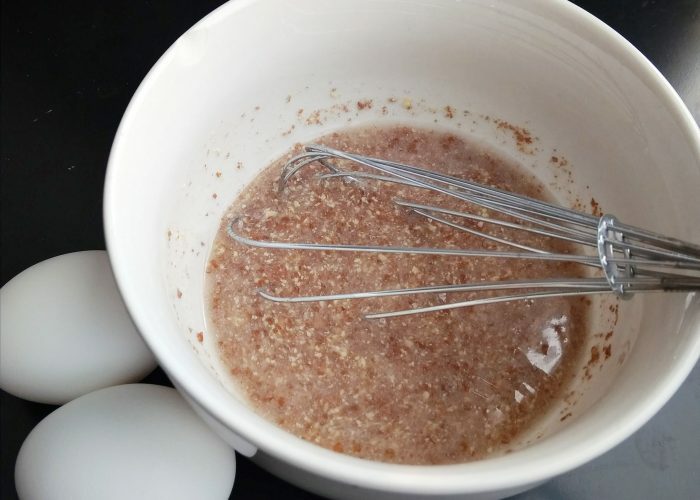 Hence, if the flax egg mixture has been sitting for a while, you may need to adjust the volume of liquid added in your recipe to obtain the same desired texture and consistency in your final product. Some suggest whisking or blending the ground flaxseed and water mixture in a food processor until white and foamy before using. This may be to incorporate more air into the flax egg which may lead to a more desirable baked product. Personally I have not tried this myself, as I have found the simple method described above to be sufficient for my baking and cooking purposes. EatingWell Editors. www.eatingwell.com. Are store-bought pre-ground flaxseeds as nutritionally effective as buying whole seeds and grinding yourself? http://www.eatingwell.com/article/290627/are-store-bought-pre-ground-flaxseeds-as-nutritionally-effective-as-buying-whole-seeds-and-grinding-yourself/. Accessed April 20, 2018. Great share, thanks a lot! You are very welcome Megala!